Education Express is a Family Program to help our local schools get FREE, much needed supplies & equipment! • Everyone can participate! Do you have children, grandchildren, nieces, nephews or even neighbors? 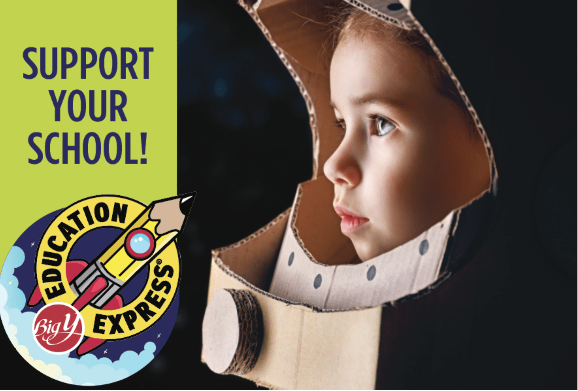 You can support their school by signing up for Education Express. • And from February 1 through April 25, 2018, for every 500 Education Express Points earned, you get a GOLD COIN! • Just shop our stores and look for the participating items marked with the Education Express logo. Each item will have a point value and savings on top of that! • Through previous Big Y Education Express programs, together we’ve given our local schools approximately $14 Million Dollars of much-needed supplies and equipment.